Double Big Bud is a perfect blend and upgrade on the original with 50% Big Bud crossed with a unique heavy yielding skunk partner. Big Bud gained much respect for its performance and characteristics that skunk growers look for around the world. The original hybrid grows short with large fan leaves but it did posses some traits that were undesirable in the grow room. We were going to copy the original strain but instead we decided to adjust the genetics to improve on the missing production qualities found in the original cross. Double Big Bud grows with more stability but with the same swollen buds. The cross is an almost pure indica plant that grows to a medium height. The buds on this one get so swollen that ventilation is a must. In the right conditions this one will outperform anything else in your grow room, especially for a plant that only takes 8 weeks to flower. 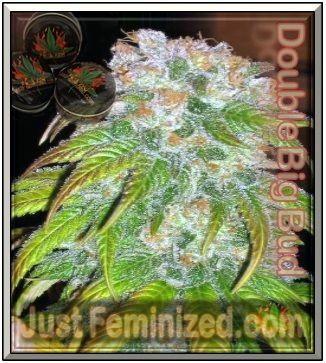 Double Big Bud posses many attributes that can be desired by medicinal growers. Premium quality feminized marijuana seeds at budget prices! 23 out of the 25 girls. Great service. Happy days.